The 2013 White Mountain National Forest Quarter is offered by the United States Mint as the first of five 2013-dated strikes of the America the Beautiful Quarters® Program. 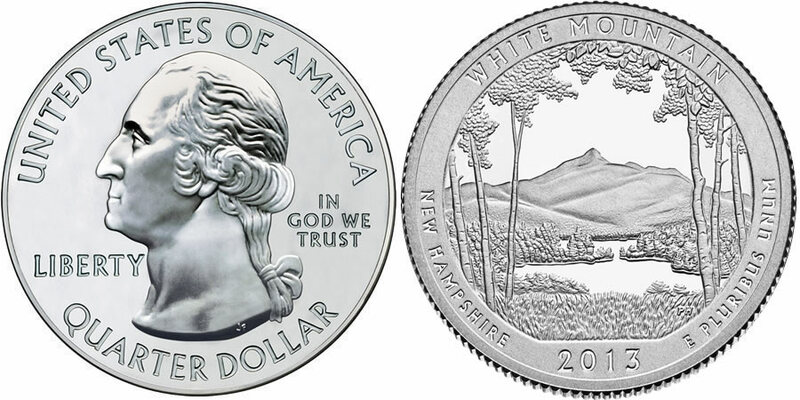 A design found on the reverse of the coin is emblematic of White Mountain National Forest which is located mostly in the state of New Hampshire. Coins of this series were authorized by the America's Beautiful National Parks Quarter Dollar Coin Act of 2008 (Public Law 110-456). Under the terms of the act, five new coins are issued annually from 2010 until 2021 when the last of fifty-six new strikes will have been released. Each coin of the series features a different reverse design emblematic of a selected site of national interest from around the United States and its territories. A majority of these coins are struck for general circulation at the US Mint's facilities in either Philadelphia or Denver. A small portion, however, are struck for numismatic purposes such as proof and uncirculated condition coins. The US Mint even typically strikes some of the quarters from a composition of silver for inclusion in special annual silver sets. White Mountain National Forest is composed of 800,000 acres. It has the distinction of being one of the most visited national forests in the nation owing, in large part, to its proximity to a large population base. Shown on the reverse of the coin is the design emblematic of White Mountain National Forest. Surrounding that design are the inscriptions of WHITE MOUNTAIN, NEW HAMPSHIRE, 2013 and E PLURIBUS UNUM.